Well, there is - but not without a little work. The website thecoverproject.net is a fantastic resource, with nicely restored box artwork for many consoles - including the 2600. Of course, the artwork has to go somewhere - and its been laid out for use in Universal Game cases. I'd love some of these cases - but they're not cheap (and shipping cost to NZ is a killer!) and I wanted that classic 80's packaging. Obviously I'm talking cardboard boxes - but they don't exactly manufacture those anymore. ...you just go and make your own! I scoured around the net looking for information. There were a good few pages and forum posts where the dimensions were listed by some very helpful people, so I figured I'd start there and make up a template in Illustrator. I measured everything, laid it out and used my amazing (cough, cough!) design skills to put in the flaps and folds... I tested the template initially with general 80gsm printer paper which folded nicely and was spot-on in terms of size... But a cardboard box is, well, made from cardboard and not general printer paper. 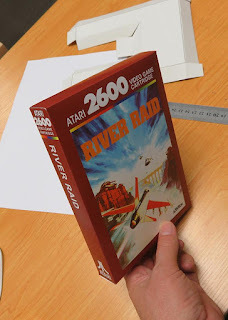 First cardboard (300gsm glossy) test I used artwork for River Raid (great game!) - It worked and looked great. I also needed to draw up an inlay to hold the cartridge in place. My first attempt I made on that was ok, but I'd made an exact sized fold-in space at the center of the inlay to hold the cart in place. 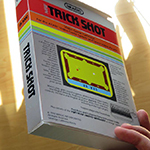 Problem was, not all 2600 carts are exactly the same size (as I discovered after buying a few Imagic games which were a little taller). The easiest way to deal with any height cart was to just not limit the height. An easy fix.The cartridge inset was ok, but a bit wide - so I had to shrink it in a couple of mm to fit nicely. You can download the blank template here (in various formats - eps, ai, pdf, svg)) if you'd like to play with it. They're in the folder "Original" included in this file. But you may want to wait until you've read the rest of this blog article (as there is a better template link further down - why? well, read on and find out). It was great - but the lid just wouldn't stay closed. 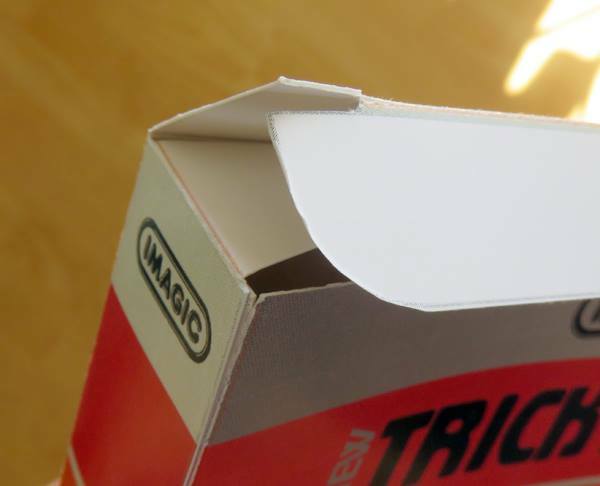 I showed what I'd done to one of our graphic designers at work - the first thing I realised from his feedback was I just didn't understand the mechanics behind box packaging. 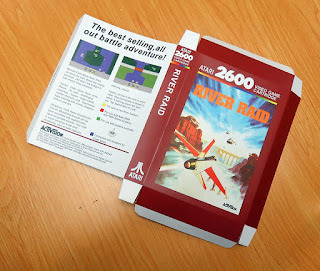 Not surprisingly - I'm a 3D artist, not a packaging master... He gave me a generic box packaging template from his resource library and I spent a good 10 minutes rebuilding the template to the dimensions necessary (overlaying the original one's I'd drawn up). 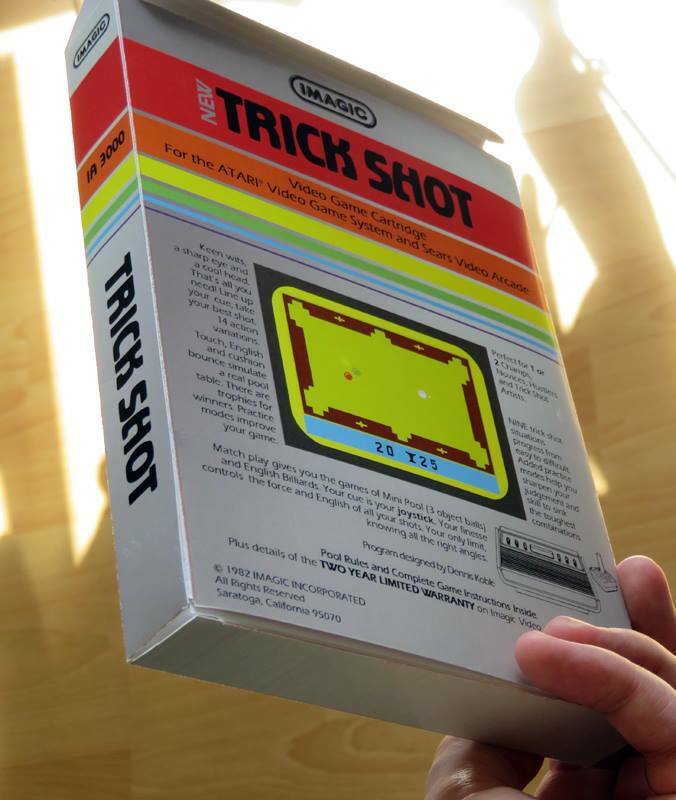 I decided to test drive this with Trick Shot - one of the cartridges I recently bought (without box - as you'd expect!). What a massive improvement using a properly designed packaging template made! Its interesting to note how important the simple-looking notches cut into the lid are. 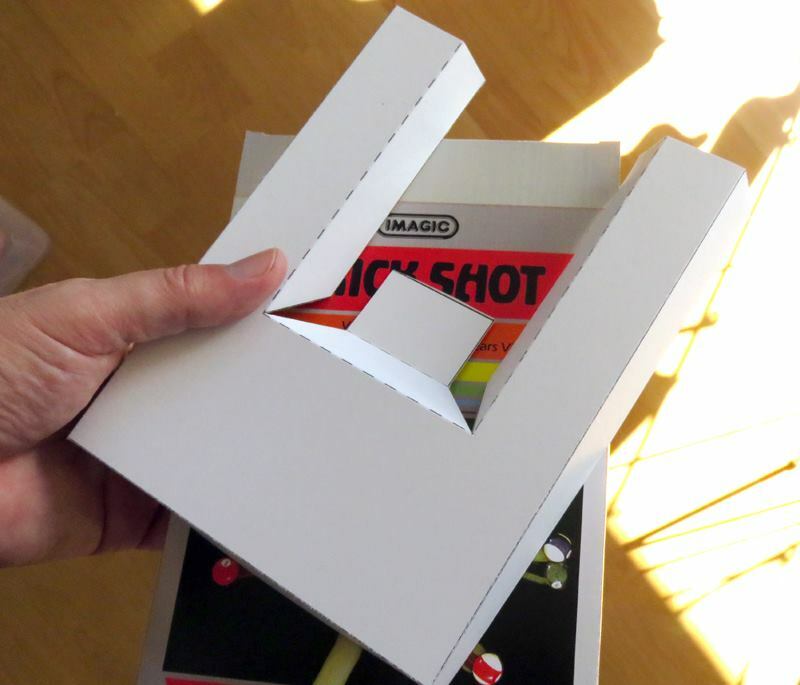 The fold is scored a little back from the actual edge of the box (unlike my 'exactly on the edge' first design) which makes it slide into the box properly - while the corners prevent the lid from pushing down and inside the box. The side flaps are cut on a gentle angle... Mine could have been a little cleaner cut (they're cut in too deep (doh!) so the lid doesn't stay in place - the bottom one I did a better job), but hey, its a learning process and I won't make that mistake again. The updated blank template is in that same file. Its in the folder "Corrected". Go ahead, give it a bash! It should print correctly if you use A3 - just make sure you don't use any "fit to page" options. It does take a little time to slice and score the box for folding, but it is worth it. For mine, I used SRA3 Glossy 300gsm because there was no glossy A3 laying around at the time. Adding the artwork will take a bit of sizing and adding in top/right/bottom colours (or copy-paste parts of the original artwork which I had to do with the Trick Shot one), but its worth the time. Also, for the Trick Shot box I very, very lightly overlaid the linework so I could find the locations for cutting and scoring... They were so light they don't stand out too much so I didn't notice them at all. In my next box, I'm planning on printing them on the back (double-sided) to prevent any need for that.